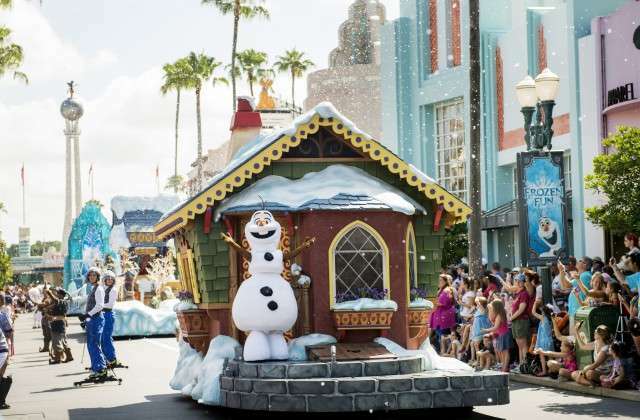 Cool off at Hollywood Studios as Frozen Summer Fun is back! The fun heats up “Frozen” Summer Fun June 17 through Sept. 7 daily at Disney’s Hollywood Studios. Guest favorites Anna, Elsa, Kristoff and Olaf are welcomed to Hollywoodland twice each day as they take part in the Frozen Royal Welcome, a festive cavalcade throughout Disney’s Hollywood Studios, accompanied by the Royal Arendelle Flag Corps and a flurry of skaters, skiers and ice cutters. The popular show, For the First Time in Forever: A “Frozen” Sing-Along Celebration, welcomes guests in the beautiful Hyperion Theater, located right in the heart of Disney’s Hollywood Studios. The Royal Historians of Arendelle host this fun and comedic retelling of the unique story of their kingdom, filled with delightful, sing-along moments from “Frozen,” plus all-new in-theater effects and special appearances by Anna, Elsa and Kristoff. Outside of the theater, there is a new merchandise location filled with all-things “Frozen”. But that’s not all that’s in store for guests visiting “Frozen” Summer Fun. The fun centers around the Event Stage throughout the day, with Olaf’s Summer Cool Down — where Olaf keeps things cool several times each day. 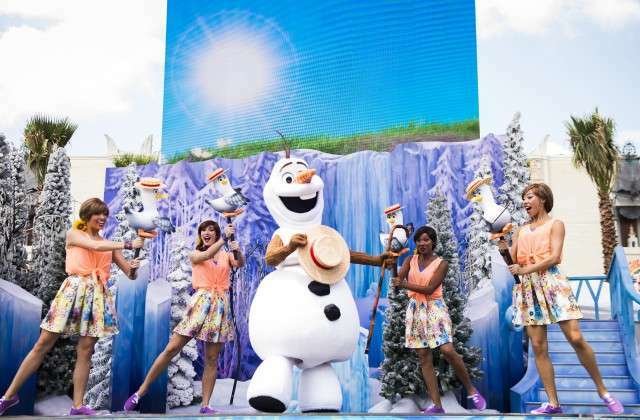 Having always dreamed of being in “snow business,” Olaf is joined by some of his summery friends to sing his famed number, “In Summer,” inviting the audience to join in. Then, Olaf sends a flurry from his personal snow cloud out over the audience in an icy blast. Twice each hour beginning at 10 a.m. daily, guests also can view a showing of the new animated short, “Frozen Fever,” which debuted in theaters with Disney’s live-action “Cinderella,” and a behind-the-scenes look at the making of the film inside the ABC Sound Studio. There’s also the “Frozen” Summer Fun Premium Package option for guests to purchase at an additional cost that includes reserved viewing for the Frozen Royal Welcome complete with regal refreshments of water, soft drinks and ice cream, reserved seating for a showing of For the First Time In Forever: A Frozen Sing-Along Celebration and Frozen Fireworks viewing paired with a Frozen-themed dessert party complete with specialty desserts, cocktails and non-alcoholic beverages. Cost is $69 for adults and $39 for children ages 3-9 (tax and gratuity included). Reservations can be made online at DisneyWorld.com or by calling 407-939-3463.